Taylor Swift, Jessica Biel, Zach Efron, Elizabeth Banks, Cara Delevingne. Maybe it is this list of celebrities wearing them that has dense the existing trend of loafers. Reasons could be plenty, but one cannot deny that custom loafers have become 'the' favourite footwear of both the sexes. Why are these loafers so much in demand? Comfortable- The biggest sole reason why loafers have become first love of many people is simply because they are very comfortable. They are made from the best fabrics, and are feather weight. Plus, they use elastic materials that help them fit just perfectly on every feet size. Dri-fit technology- Top manufacturers use dri-fit fabrics in the production of these shoes. It helps in moving away the sweats off the feet from the inner surface to the outer, and then evaporates it quickly. Ultimately adding much to its comfort level. Imprints- Many different designs or even texts can be imprinted on them. Texts- although not very common for customers to experiment of this kind, but hey, one can try, right? 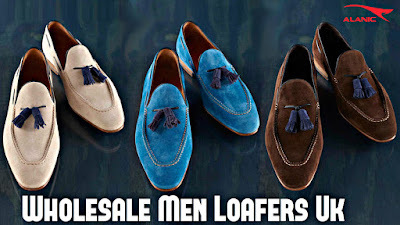 Stylish- These loafers are undeniably very stylish and good looking. Without laces, low ankle, different layers of separate soles- come on now, how awesome is that. Also, if it wasn't for their trendy look, we wouldn’t have seen big celebrities sporting them. Along with its comfort level, another important thing that has helped to uplift the overall popularity of these loafers is that they blend in perfectly with many different events and occasions. You would see every other student in colleges and high schools sport these customized loafers. It has been worn in parties, weddings, hangouts, and dates. And oh, who can forget that legendary dude who wore them in his office, finally paving the way for the rest of us. If you are in shoe business, hail big manufacturers. For they are offering you to design your own loafers- from colour and design to size and texture. So you can eliminate all the risks of ‘what ifs’, and order exactly what your customers want.